The aim of this study is investigation of properties of polymer concrete with fly ash as filler for obtaining new composite building materials. Polymer concrete realized of epoxy resin, fly ash and crushed fine and coarse aggregates has been prepared for assessing the influence of fly ash and resin dosage over its properties. Density, microstructure, compressive strength, flexural strength and split tensile strength were studied for different combinations determined on the design of experiments concept. The experimental results confirm the possibility of using fly ash to produce polymer concrete at a potentially lower cost and without compromising its structural integrity. The use of fly ash as a filler in polymer concrete is very promising because it improves the physical properties of the material and particularly its compressive and flexural strength. M. Harja, M. Barbuta and L. Rusu, 2009. Obtaining and Characterization of the Polymer Concrete with Fly Ash. Journal of Applied Sciences, 9: 88-96. Polymer concrete is part of group of concretes that use polymers to supplement or replace cement as a binder. The types include polymer-impregnated concrete, polymer concrete and polymer-portland-cement concrete. The usual building material, namely Portland cement concrete is prepared by binding aggregates with Portland cement paste. In time cement concrete has been improved by adding polymeric additives and polymeric materials were used for substituting partially or totally the hydraulic cement binder (Fowler, 1999). Polymeric concrete is a composite material in which the aggregates are included in a polymer matrix. The use of polymer resin instead of Portland cement in the concrete mix improves the mechanical behavior and durability properties. The final characteristics of polymer concrete depend on the type and dosage of resin binder, type and amounts of filler and aggregates. Studies on polymer concrete with different types of resin such as: epoxy resin (Abdel-Fattah and El-Hawary, 1999; Reis, 2004; Aggarwal et al., 2007), polyester resin (Varughese and Chaturvedi, 1996; Gorninski et al., 2007; Jo et al., 2007, 2008), furan resin (Muthukumar and Mohan, 2005), poly (methylmethacrylate) (Blaga and Beaudoin, 1985) indicate the preoccupation in this field. For increasing the properties of polymer concrete various fiber reinforcements are used (glass, carbon fibers, PVA, etc.) (Reis, 2004; San-Jose et al., 2008). Advantages of polymer concrete include: rapid curing at ambient temperatures, high tensile, flexural and compressive strengths, good adhesion to most surfaces, good long-term durability with respect to freeze and thaw cycles, low permeability of water and aggressive solutions, good chemical resistance, good resistance against corrosion, lightweight, may be used in regular wood and steel framework, may be vibrated to fill voids in forms, allows use of regular form-release agents. Disadvantages: some safety issues arise out of the use of polymer concrete; the monomers can be volatile, combustible and toxic; polymer concretes also cost significantly more than conventional concrete. Different types of fillers can be used, considering especially the industrial wastes are: fly ash, slag, micro silica, cinder, phosphogypsum, etc. (Rebeiz et al., 2004; Varughese and Chaturvedi, 1996; Barbuta and Lepadatu, 2008). 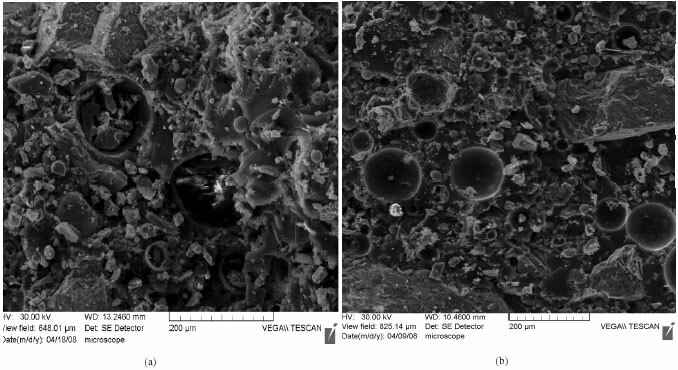 Fly Ash (FA) results as inorganic waste material of pulverized coal in thermoelectric power stations. The use possibilities of the ash are induced both by the chemical and mineralogical composition and by the technical proprieties (Goumans et al., 1994). The use of coal fly ash has important economical and environmental implications. In Romania annually great FA quantities resulted: in 1980 resulted 15 millions tons of FA, in 1985 obtained 30 millions tones and after 1990 the FA quantities decreased because the electricity consumes reduced. In our area annually resulted around 21740 tons of fly ash. In the last twenty years resulted approximately 500 millions tons of fly ash, from that a small part is capitalized. The FA unused is disposal on the landfill. Aggregates of different mineralogical composition such as granite, clay, quartz, crushed stone, gravel, limestone, chalk, etc., can be use for obtaining polymer concrete (Muthukumar et al., 2003). The study presents the experimental results of studies on polymer concrete realized with epoxy resin, fly ash and aggregates. 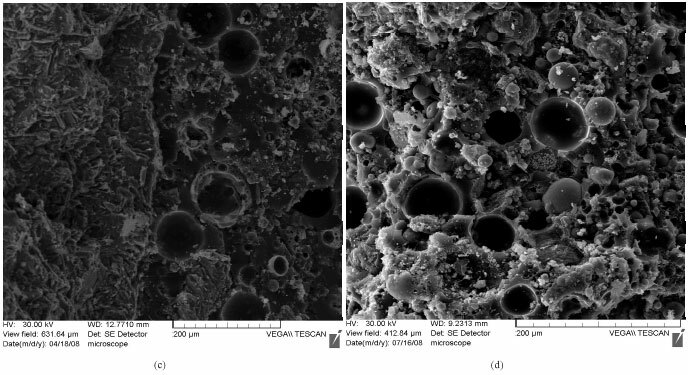 The influence of fly ash dosage on mechanical strengths and microstructure of polymer concrete is investigated. The polymer concretes were characterized by measuring the density, studying its microstructure using scanning electron microscope and by determining by experimental tests the compressive strength, flexural strength and split tensile strength. Experimental researches were realized during last year in the laboratory of Chemical Engineering Faculty for determining the chemical properties (fly ash and polymer concrete) and in the laboratory of the Civil Engineering Faculty for determining the mechanical properties. For preparing polymer concrete the following materials were used: epoxy resin, produced by Policolor S.A Bucuresti that was combined with the hardener in proportion of 35% by weight of resin; fly ash class F, resulted after combustion of pit coal from the Thermal Power Station Holboca Iasi; crushed aggregates of two grades 0-4 mm (Sort I) and 4-8 mm (Sort II), obtained from river stone by crushing. For chemical analysis of the fly ash was used following methods: destructive analytical method, for oxidic composition; the thermogravimetrical analysis has been performed with a MOM Budapest Q-1500 Thermogravimeter. Particle size distribution was performed with laser diffraction particle size analyzer SALD-7001 equipped with violet laser. That measured particle size in range 15 nm (0.015 to 500 μm). The test samples were dispersed in deionised water using sodium hexametaphosphate and ultrasonic disagglomeration. The mixtures used in the present study derived from a previous statistical design of experiments that optimized the polymer concrete mixture for a reduced interval of resin having in view the high cost of polymer. 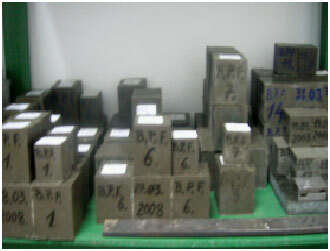 A number of fifteen mixed of polymer concrete with fly ash (notated with BPF 1 to BPF 15) were investigated. The dosage of epoxy resin varied in a limited interval (12.4 to 18.8%) imposed by of the mixer viscosity and cost. The fly ash content varied from 6.4 to 10.4%, from the condition of workability. Also from the mixture optimization design different dosages of aggregates have been resulted (Barbuta et al., 2008). The studied compositions are given in Table 1. Polymer concrete mixtures given in Table 1 were prepared by mixing required quantities of binder (epoxy resin plus hardener) firstly with aggregates, than with the filler (fly ash) that was added slowly in a mechanical mixer. The specimens (prism of 210x70x70 mm sides and cubes of 7.07 mm, Fig. 1) were prepared for determining the mechanical characteristics: Compressive Strength, Flexural Strength and Split Strength. After 14 days of normal curing, three samples per mix were tested, according to standard techniques. Fly ash characterization: The possibilities to use the ash in order to obtain new types of materials with epoxy resin result from their chemical and mineralogical composition and also from their technical properties. The chemical composition of fly ash depends on the coal composition, while its mineralogical composition may vary considerably from the original matter and is also a function of the combustion operation. The chemical composition is presented in Table 2, were LOI (loss on ignition) is unburned carbon. Based on their chemical composition, these ashes are classified in Class F (Harja et al., 2008). From IR analysis was observed that in the ash samples can find compounds like: quartz, kaolin, hematite, illite, lime, carbon and an appreciable content of amorphous aluminonosilicates (Vassilev et al., 2003). The particle size distribution is given in Fig. 2. Analyzing the data from Fig. 2 it can see that the medium diameter is 18 μm, the fly ash behaviors as filler. For Scan Electron Microscopy (SEM) Vega Tescan analysis running at 30 kV were taken to investigate particle morphology. An Ag sputter coating was applied to the surface of the specimens to provide greater depth of image. The microscopic image from Fig. 3 confirms, according to the specialty literature (Kutchko and Kim, 2006; Sarbak et al., 2004), that the fly ash has particles with spherical form, there are sporadically particles of irregular size, which can be assigned to different physical state of silica. Microstructure of polymer concrete: To understand the microstructure of polymer concrete morphological studies were carried out. Figure 4 shows the surface of polymer concrete corresponding to polymer concretes (BP) made using epoxy resin and aggregates, without FA. The picture clearly shows the presence of voids in the polymer concrete. In the case when resin content increases this is reticulated in the different positions having as consequence the presence of the voids of big size. It can be observed that as the resin content decreases from 18 to 12.4%, there is a progressive decrease in the microspores sizes. Analyzing the images was observed the content of resin is too much in all samples and appears problems at the interface aggregate-resin (Fig. 5). For improving the adherence properties between the binder and the aggregates the fly ash was introduced in the polymeric concrete, according to the mixtures given in Table 2. 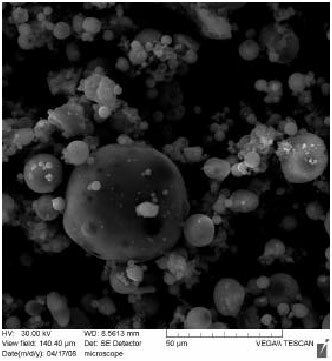 The images obtained for polymer concrete with fly ash using Scanning Electron are presented in Fig. 6. The pictures clearly show that the resin is not agglomerated as in the case of polymer concrete without fly ash, the fly ash occupies the spaces among aggregates and the structure becomes more homogeneous. It can be seeing that the increase of fly ash content determines the decrease of the number and size of voids. Mechanical properties of polymer concrete: The specimens were tested under identical conditions, according to European Standard EN 12390/2001. Compressive strength (fc), flexural strength (fti) and split tensile strength (ftd) at 14 days were determined experimentally, according to standard techniques. In the case of the polymer concrete without fly ash, was obtained the data presented in Table 3. It can observe that the higher value of compressive strength was obtained for 14% resin and it increases with increase of resin content. If for the flexure strength the increase of resin content has not a significant influence, the split tensile strength is improved by the increase of resin content. In conditions of high cost of resin improving polymer properties by increasing the resin dosage is not economically. Also, the morphological analysis showed that the increase of resin content determines its agglomeration without a better coating of aggregate. For improving the properties the fly ash was added. The use of fly ash as filler in polymer concrete will contribute to the capitalized of a by-product that in Iasi area is deposed on landfill being used in reduced quantities. For the mixes presented in Table 1 the mechanical properties were summarized in Table 4. The influence of FA dosage on compressive strength is shown in Fig. 7. The values of compressive strength as it can be seen in Fig. 7 vary function the fly ash dosage, the maximum value of 69.82 MPa is obtained for a dosage of 12.8% fly ash (BPF2) and the minimum value of 57.96 MPa was obtained for a dosage of 6.4% fly ash (BPF3). The polymer concrete with the maximum value of compressive strength (BPF2) has the minimum content of epoxy resin (12.4%) and aggregates (37.4%) and maximum content of fly ash (12.8%). For obtaining bigger values of compressive strength it must increase the fly ash dosage and reducing the aggregates content. Therefore, the fly ash content influences the compressive strength, the biggest strength having the polymer concrete with the highest content of fly ash (BPF2) and the smallest strength was obtained (for the same resin content of 12.4%) for the polymer concrete with the smallest content of fly ash (6.4%). Influence of FA dosage on compressive strength for the same content in resin (12.4% epoxy resin) was presented in Fig. 8. From the Fig. 8 it can observe that compressive strength linearly increases with fly ash dosage increase. In Fig. 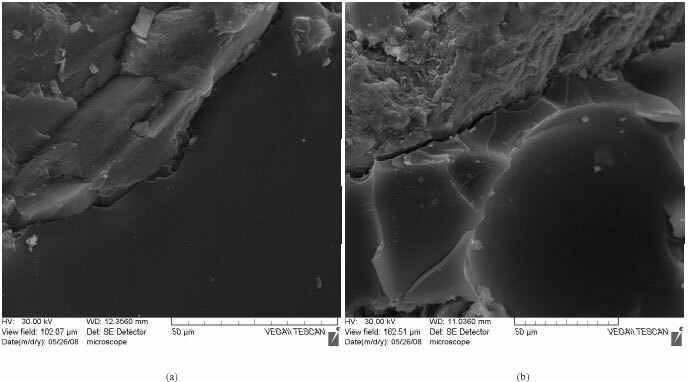 9 is presented the influence of epoxy resin dosage on compressive strength for 6.4% content in fly ash. Figure 9 shows that epoxy resin has the same influence over compressive strength. The effect of FA dosage on flexural strength is shown in Fig. 10. The maximum value of 16.85 MPa was obtained for a dosage of 9.6% fly ash (BPF 8) and the minimum value was 13.70 MPa for a dosage of 8.0% fly ash (BPF 15). The polymer concrete with maximum value of flexural strength (BPF 8) has minimum epoxy resin dosage (12.4%), medium fly ash content (9.6%), a bigger content of sort I aggregate compared with sort II that is with minimum dosage (37.4%). For obtaining bigger values of flexural strength it must increase aggregate sort I and to maintain at minimum aggregate sort II. As it is shown in (Rebeiz et al., 2004), fly ash can be used as a fine aggregate replacing partially or totally the sand from river aggregates, the combination showing synergism in strength behavior up to the level of 75% by weight of fly ash. In Fig. 11 is presented the influence of fly ash dosage on flexural strength for 12.4% content in resin. For the 12.4% epoxy resin dosage the flexural strength insignificantly decreases and it results that the fly ash dosage must be increased. The effect of FA dosage on split strength is shown in Fig. 12. The results presented in Fig. 12 show that split tensile strength increases with bigger dosages of epoxy resin. For small dosages of epoxy resin improving of split tensile strength can be obtained by increasing of fly ash dosage. 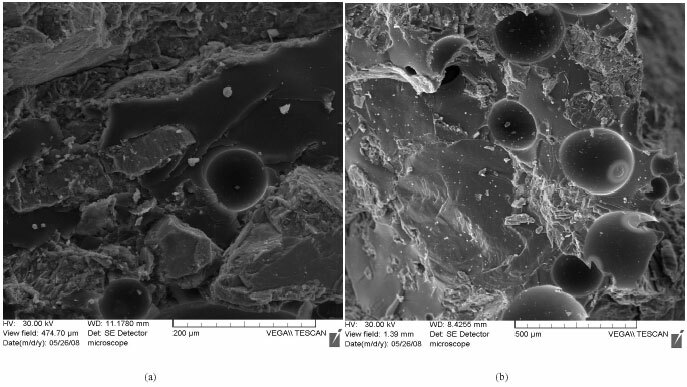 The effects of FA dosage on split tensile strength for 12.4% resin are shown in Fig. 13. It can observe that the fly ash improves the split tensile strength of polymer concrete. The study shows that the fly ash can be used in polymer concrete for improving the characteristics. This composite material is used in the next stage of experimental research for obtaining hybrid composite elements. Using of fly ash as filler is important because it improves the mechanical proprieties of polymer concrete and also this is one way for capitalizing by-products that in our areas is in great quantities on the landfill. The fly ash is class F, chemical composition, size distribution and shapes of particles make possible it using as filler in the concrete. Polymer concretes were prepared using different dosages of epoxy resin, fly ash as filler, fine and coarse aggregates. The compositions were determined using design of experiments for a limited content of polymer. In the case of polymer concrete without fly ash it can observe agglomeration and dislocation at the interface resin-aggregate. The fly ash fills the free spaces determining a more homogenous structure. The polymer concrete with fly ash present a reduce number of voids of small sizes. The increase of fly ash dosage results in bigger values of the compressive strength. The polymer concrete with maximum value of flexural strength has minimum epoxy resin dosage, medium fly ash content, a bigger content of sort I aggregate compared with sort II that is with minimum dosage. For obtaining bigger values of flexural strength it must increase fly ash dosage and aggregate sort I. The split tensile strength increases with bigger dosages of epoxy resin. For small dosages of epoxy resin improving of split tensile strength can be obtained by increasing of fly ash dosage. The future experimental researches have as objective to establish the influence of the fly ash dosage bigger than 15% on the mechanical proprieties of polymer concrete. Abdel-Fattah, H. and M. El-Hawary, 1999. Flexural behavior of polymer concrete. Construct. Build. Mater., 13: 253-262. Aggarwal, L.K., P.C. Thapliyal and S.R. Karade, 2007. Properties of polymer-modified mortars using epoxy and acrylic emulsions. Construct. Build. Mater., 21: 379-383. Barbuta, M. and D. Lepadatu, 2008. Mechanical characteristics investigation of polymer concrete using mixture design of experiments and response surface method. J. Applied Sci., 8: 2242-2249. Barbuta, M., D. Lepadatu and B.M. Patras, 2008. Mixture design of experiment for multicriterial optimization of polymer concrete. Jubilee International Scientific Conference VSU’ 2008, May 29-30, Lyuben Karavelov, Sofia. Bulgaria, 2008, http://www.vsu.bg/Konferenciq_2008_EN/konferenciq_EN_Programme.html. Blaga, A. and J.J. Beaudoin, 1985. Polymer Concrete-Canadian Building Digest. CBD, 242, Ottawa, USA..
Fowler, D.W., 1999. Polymers in concrete: A vision for the 21st century. Cem. Concr. Compos., 21: 449-452. Gorninski, J.P., D.C. Dal Molin and C.S. Kazmierczak, 2007. Comparative assessment of isophtalic and orthophtalic polyester polymer concrete: Different costs, similar mechanical properties and durability. Constr. Build. Mater., 21: 546-555. Goumans, J. M., H.A. Van Der Sloot and T.G. Albers, 1994. Environmental Aspects of Construction with Waste Materials (Hardcover). 1st Edn., Elsevier Science Ltd., Amsterdam, ISBN: 100444818537. Harja, M., M. Barbuta, L. Rusu and N. Apostolescu, 2008. Utilization of coal fly ash from power plants: I. ash characterization. Environ. Eng. Manage. J., 7: 289-293. 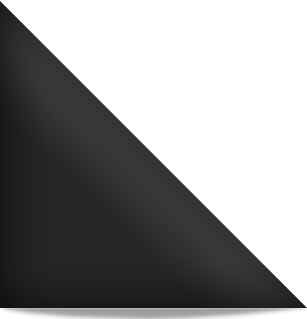 Jo, B.W., G.H. Tae and C.H. Kim, 2007. Uniaxial creep behavior and prediction of recycled-PET polymer concrete. Constr. Build. Mater., 21: 1552-1559. Jo, B.W., S.K. Park and J.C. Park, 2008. Mechanical properties of polymer concrete made with recycled PET and recycled concrete aggregates. Constr. Build. Mater., 22: 2281-2291. Kutchko, B. and A. Kim, 2006. Fly ash characterization by SEM�`EDS. Fuel, 85: 2537-2544. Muthukumar, M. and D. Mohan, 2005. Studies on Furan Polymer Concrete. J. Polym. Res., 12: 231-241. Muthukumar, M., D. Mohan and D. Rajendran, 2003. Optimization of mix proportion of mineral aggregates using box behneken design of experiments. Cem. Concr. Comp., 25: 751-758. Rebeiz, K.S., S.P. Serhal and A.P. Craft, 2004. Properties of polymer concrete using fly ash. J. Mater. Civil Eng., 16: 15-19. Reis, J.M.L. and A.J.M. Ferreira, 2004. Assessment of fracture properties of epoxy polymer concrete reinforced with short carbon and glass fibers. Constr. Build. Mater., 18: 523-528. San-Jose, J.T., I.J. Vegas and M. Frías, 2008. Mechanical expectations of a high performance concrete based on a polymer binder and reinforced with non-metallic rebars. Constr. Build. Mater., 22: 2031-2041. Sarbak, Z., A. Stanczyk and M. Kramer-Wachowiak, 2004. Characterisation of surface properties of various fly ashes. Powder Technol., 145: 82-87. Varughese, K.T. and B.K. Chaturvedi, 1996. Fly ash as fine aggregate in polyester based polymer concrete. Cement Concrete Composites, 18: 105-108. Vassilev, S., R. Menendez, D. Alvarez, M. Diaz-Somoano and M.R. Martinez-Tarazona, 2003. Phase-mineral and chemical composition of coal fly ashes as a basis for their multicomponent utilization: 1. Characterization of feed coals and fly ashes. Fuel, 82: 1793-1811.